Sandwiches are so easy and simple to make. Ingredients are available to the nearby grocery stores. You can make variety of sandwich fillings by combining different ingredients based on your imagination. 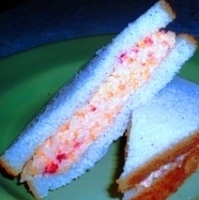 Cheese Pimiento Sandwich is an old time family favorite. Spread evenly on sliced bread. It's so tasty & nutritious. This is really a winner! Aside from grilled ham & cheese ( velveeta ), cheese pimiento is what I want --- crave for, actually --- to lie between my slices of bread! Thank you very much, Mam, for posting this. I can't wait for your future postings! A very quick snack that kids and adults will enjoy. Toasting or pan-grilling the bread is a nice twist too.